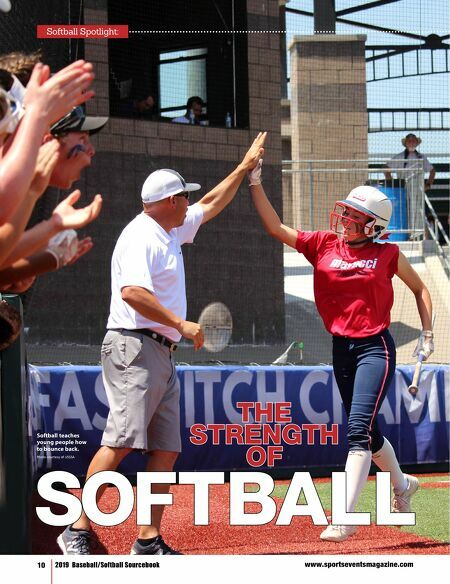 www.sportseventsmagazine.com 2019 Baseball/Softball Sourcebook 11 It's All About Teamwork BY PAIGE TOWNLEY hile many individual and team sports have been experiencing a decline in participation, the same can't be said for softball. According to the annual report by the Sports & Fitness Industry Association (SFIA), baseball and softball combined to rank as the most participated team sport in the United States in 2017, with nearly 25 million participants. Over the last five years, casual participation in slow-pitch softball is up 34 percent. Perhaps part of why the sport is faring so well is what it teaches both on and off the field. "Softball is such a great sport for learning life lessons," said Jami Lobpries, vice president of marketing for the United States Specialty Sports Association (USSSA). "It's a sport of failure, so it teaches young athletes how to handle failure, how to bounce back from it and handle adversity. It's all about team- work and that is important to prepare kids for life off the field." USSSA has more than 25,000 softball teams, which means the association has approximately 300,000 athletes in the sport. "And that number is steadily growing for us," Lobpries said. "It has been growing since 2009. In fact, in 2009, we had just around 8,000 playing, so we've seen some serious growth." Along with that participation growth has come some major growth in the organization, such as USSSA now being an associate member of the World Baseball Softball Confederation (WBSC), the world governing body for baseball and softball. "We officially became an associate member in October of 2017 and we're very excited about it," she said. Also, critical to USSSA is its new Space Coast Complex in Viera, Fla. Originally, Space Coast Stadium served as the spring training facility for the Florida Marlins, Montreal Expos and Washington Nationals but after a $50 million renovation, USSSA reopened the venue in November 2017 as the USSA Space Coast Complex. The 85-acre complex features 15 all-turf fields and three championship stadiums, including an 8,100-seat all-turf stadium for baseball and softball with 11 suites. With 1.3 million square feet of turf, three HD state-of-the-art video boards and the latest LED lighting technology, the facility has become the home of USSSA Softball and already serves as home of the USSSA Pride, the professional women's fast-pitch league. "It's such a dynamic atmosphere and a great setting for the sport," Lobpries said. "It's also a setting in which we can host so many different events and we're excited about the opportunities the venue is providing." Thus far, those opportunities have been many, especially for offering spring training for high school and college teams. "We are looking to bring in all divisions and spring training will start in 2019," she said. "It's also providing international exposure since we are now associate members of the WBSC because that gives us the opportunity to host international events and bring in international athletes, which helps us grow the sports." But USSSA isn't the only organiza- tion with a new facility that's focused on promoting and growing the game. In its fourth year, the West Michigan Sports Commission's Art Van Sports Complex is already having a $5 million impact to the local economy. Use of the eight-field complex is focused on hosting travel baseball and softball teams, and the commission has been going after unique events as well, such as the 2017 International Softball Congress' Men's World's Fastpitch Championship, which brought in people from several different ► W Softball Spotlight: Quest Media Design The West Michigan ISC Bombers at bat.